Something wonderful happened on my way to find all my “UFOs” (UnFinished Objects)! On my last blog, I challenged myself to find all my unfinished projects and make a plan to finish them. 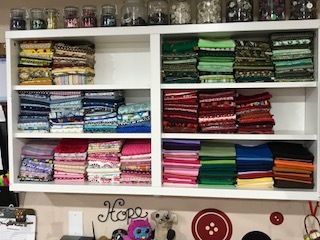 Well, as I started looking, I realized that it was best to look in all my fabric bins – never know what might be hiding in there! As I did this, I thought to myself, “As long as I’m doing this, I should sort and reorganize all my fabric bins at the same time.” As you can imagine, this turned out to be a much bigger project than I thought! I do try to go through most of my bins at least once a year in order to get ready for my upcoming camps. This helps me figure out what fabric I have, and what I need. However, you know as well as I do that, when you take stuff out of plastic bins, it’s never neat putting them back in (unless you take the time to refold and straighten them – and for me that never happens). Instead, it seems that I am always in a hurry and just shove everything back in. And for good reason – I have a busy life besides teaching sewing classes 5-6 days a week. I also homeschool my 7-year-old granddaughter! Anyway, needless to say it all got done – and I am pretty proud of myself! Went through 33 bins total. Purged 3 bins’ worth of fabric to donate. Consolidated and sorted ALL my bins (some, I might say, have not seen the light of day for some time). Now I bet you’re wondering: how many UFOs did I find? And how many did I actually work on? The answer to the second question is… I have not had time to work on any. Sorry to disappoint you! In addition, answering the first question is harder than it seems. So I will give you the short version: I found 8 bins full of UFOs. Keep in mind not all of my bins are the same size, and not all of them were full (while others were stuffed to the brim). However, the good part is now my UFOs are all together with their friends. And now it will be much easier to organize them and begin working on them when I have the time! Here are some before and after pictures of my fabric organizing process – I use this method on a regular basis. Hopefully for my next blog I’ll have them all my UFOs counted, sorted, and some even completed! 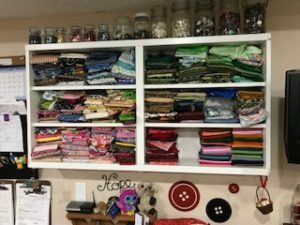 I did notice on Facebook that lots of sewing sites were doing this same thing, confessing how many projects they needed to complete, and then working on them. Must be time for Spring Cleaning! Sewing Tip: If you’re anything like me, you have a lot of UFOs and stray fabric laying around, and not enough time to complete everything. This can be quite intimidating! Instead, focus on little victories, and accomplish small steps throughout the week whenever you get a spare 10-15 minutes. You’ll get a lot more done, and the project won’t seem nearly as overwhelming. In fact, you may even find it fun! Wishing all of you luck in sorting, organizing and completing all your UFOs! I’m so excited to show you my new hand sewn quilt! My mom is getting older, and has been ill for the last few years. Because of this, I wanted to make this upcoming sewing project extra special. After a few weeks of racking my brain, I decided a quilt was in order. I went to my go-to place for ideas (Pinterest) and began looking. I wanted something that would show her that she has a ton of people that love and care for her. After a little while of searching, I found the perfect idea: a family tree. I figured out my next steps and, with fabric in hand, began this project of love for my mother. Step 1: I selected my background fabric (a white-on-white pattern looking somewhat like clouds), and the tree fabric (which looks like tree bark). I cut out the bark and placed it where I wanted it to go on the white fabric. Then, I applied “Wonder Under” – an iron glue – to stick it firmly in place. It ended up looking exactly as I wanted it to. Step 2: I then sewed around the outline of the tree with a blanket stitch. This added subtle detailing and ensured the tree stayed in place. 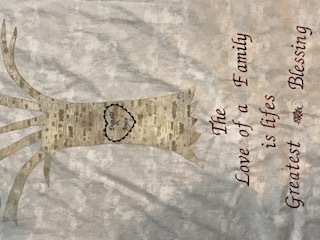 Step 3: I looked online and found the perfect phrase to add to my quilt, as well as a heart with my parents’ names in it. I machine-embroidered these on with my fancy sewing machine, and took a look at my handiwork. I loved it! Step 4: Now I wanted to make sure the names of our whole family were on it. These included my mom’s three daughters, seven grandkids (and their spouses), and 12 great-grandkids. 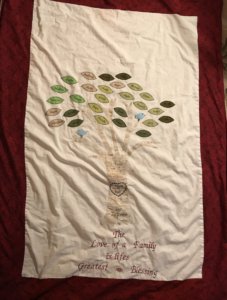 I wanted her to be able to identify which children belonged to whom, so I grouped them each family together – each daughter with her kids and grandkids – and put these families in different colored leaves. 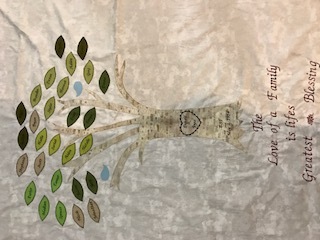 I machine embroidered each name onto a leaf, and applied them to the quilt the same way I did the tree. I also blanket-stitched each leaf (like I did the tree), but with black thread to make them stand out. Step 5: I chose very soft minky for the back – this is a very soft fabric similar to fleece, but is softer and thicker. I also found a red border to go around it, since that’s Mom’s favorite color. I decided not to stitch the minky into the quilt, as I knew doing so would bunch and tear the delicate fabric. 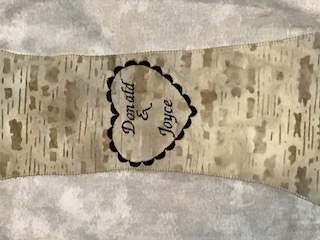 Note: I completed this project with the help of my baby lock embroidery machine – it has many fancy stitches! However, you don’t need to have a fancy machine to make a quilt or wall hanging like this. Instead of a blanket stitch around the tree and leaves, you can do a satin stitch, or just a zigzag stitch. Whichever you choose, make sure to follow the directions in your machine’s book. For the phrase at the bottom, you can use machine embroidery, or can sew it on by hand. You can also write the words using fabric pens. There are many ways to get the job done! Sewing Tip: I have said this before, and I’ll say it again: homemade gifts from the heart are always the best. It may be tempting to purchase a present from the store, but in the end a homemade gift speaks volumes, and is so much more meaningful. Not to mention, the process of creating is fun enough to make it all worth it! I’m not sure what my next sewing project will be yet – it will be a surprise! When I think of some of my favorite fabric shops in the Portland area, they are often small, independent, locally-owned stores. I’ve decided that I’ll periodically feature some of these shops here, sharing some real gems for you to explore! As I approach cool cottons fabric shop at 2417 SE Hawthorne, in Portland, I enjoy that I’m walking up to the front door of a house. This place has long impressed me with their incredible selection of prints. As you’d guess from the name, it has a lot of cotton. Cotton and cotton and more cotton, in colorful prints, black and whites, and even an organic section. When you touch the fabric, the quality is striking. It has a distinct texture that is a pleasure to feel. With such a large selection of prints, it’s great fun to find patterns that completely personalize a project. When I made my umbrella from a kit I purchased at cool cottons, I was able to choose sewing-themed fabric, which delights me! From cozy flannel to beautiful cotton/linen blends, and an incredible selection of colors and prints, cool cottons has you covered. The shop was started six years ago by Marie, who currently owns the business, running it with the assistance of her employee Linda. To find just the right fabric for a personalized project, I encourage you to visit Marie and Linda at cool cottons and experience it yourself!